SINGAPORE / ACCESSWIRE / December 24, 2018 / When you find a new road to go home faster, but the Google map has not been updated for several months, so you can't find it when you navigate, what should you do? If you are in Indonesia, you can actively report this change in GoWithMi's 3D map app, and after other people's "random consensus verification", you solve not only this problem but also receive the GMAT Token reward. Since May 2018, in Indonesia, 1.1 million users have used GoWithMi's world's first decentralized map for personal terminal APP products. People have unwittingly completed "the creation, verification, and collaboration of consensus maps" in various "gamification" mission scenarios. When Vitalik Buterin recently tweeted "a lot of development in non-financial applications," GoWithMi has long been at the forefront of leading the blockchain's widespread deployment of food, clothing, housing, and living. GoWithMi is the world's first complete decentralized location-based service platform. Through the spatial consensus mechanism and spatial computing power network, allowing the complete decentralization of the entire system from data, computing, personal to commercial terminals of the map location-based service and to fully reconstructed, making the decentralized location-based service the core component of the entire blockchain network. Integrating the three key features of consensus map, super spatial oracle, and decentralized location-based service, and can be freely called by various upper-layer applications of the Internet and blockchain networks to achieve programmable business. GoWithMi eliminates the drawbacks of centralized maps and brings a new dawn to the daily life for blockchain applications. All real-life vehicles must pass the map location-based service to convert their information in the physical space into their information in the digital space, and then integrate with Internet services. The map service is an unquestioned high-frequency service. According to estimates, Baidu map location service is called more than 80 billion times a day, and Google Maps location-based service is called more than 100 billion times. This "supercenter terminal" map location-based service model has fostered the "data-driven" profit model of the Internet giant, and its roots must be "maximizing the occupy of user privacy and data." 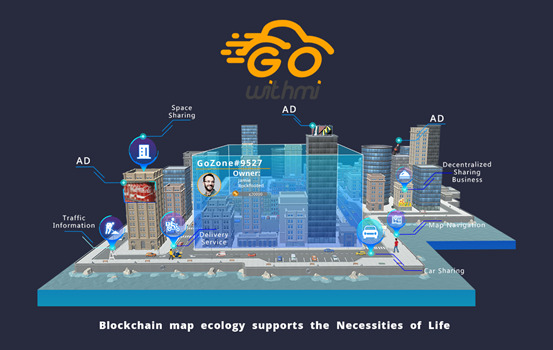 GoWithMi decentralized map is to break the monopoly control of "supercenter", to create a peer-to-peer map service infrastructure network homologous isomorphism to blockchain, release the freedom of "data and call services", and change "data-driven" to "equal rights and mutual benefits driven", and become the infrastructure supporting the economic concept of blockchain equal rights. 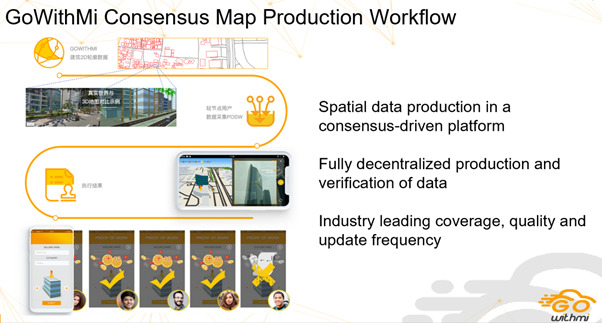 Consensus Map: Through consensus game data production, people in every corner of the world can participate in the co-construction of a "consensus map" without any thresholds. Everyone participates, and everyone benefits, making the map's basic service facility a "map that everyone shares", rather than a tool that is exclusive to a company and becomes a monopoly for its free possession of personal location data. Decentralized location-based services: covering map positioning, search and query, route navigation, peripheral and road conditioninformation search, spatial smart mining, and other complete functional systems. One-stop support for taxi, food delivery, room reservation, and other ecological applications. Super Spatial Oracle: The native spatial oracle in the chain, answering the question of the credible space facts that triggers the smart contract, such as "where are you", "where are you going", "how did you get there", etc., for automatic execution of smart contracts, fill in the gap of the location-based "secure spatial oracle", and effectively promote the seamless integration of Ethereum, EOS and other public chain networks with the business outside the chain. GeoMesh sharding mechanism to achieve storing full data on the chain. GeoMesh Sharding processing is performed on all size map service data. Single GeoMesh can independently provide full-featured location-based services such as search and navigation, and parallelization can provide global location-based services. The spatial root chain structure enables full production on the chain. The self-developed automatic compiled map engine and DPOS BFT consensus mechanism are produced in the world's first full chain of map service data. Space peer-to-peer computing network, achieving storing full data on the chain. Allow the CPU, memory, hard disk, network and other computing resources of all objects to have "equal rights mining" and resist "mining pool control". Spatial multi-party random sharding protocol, which forms an anti-attack sharding chain. Block production is carried out between massive equal rights nodes, which not only ensures the high performance required by the business but also avoids the super node centralization defects. Based on leading technology, GoWithMi pioneered the decentralized consensus map production model in the industry, can fully realize the "end-to-end" one-stop support of trusted location-based service network from data consensus collection, decentralized data production, decentralized location engine to large-scale commercial, thus leading the global map industry to directly leap from the 1.0 electronic map, 2.0 crowdsourcing map to the 3.0 consensus map era. GoWithMi economic system is designed to build a co-constructed and mutual benefits economic ecology. Traditional map applications providers use prizes redeem by points or substances to encourage users to contribute data. In essence, it is a form of salary in which everyone except the company can only get wages instead of value, and the value belongs to the company. Through the designed with economic incentives mechanism, GoWithMi ensures that every user can participate in the positive and negative game to continuously create new value, and the value is based on the anchoring of permanently immutable digital assets, so that every ecology builder can share value. By executing the coordination game of data collection, reporting data to generate revenue, and mortgage GMAT to obtain high return tasks. Regardless of the performance of the equipment, by providing spatial computing power, gaining equal rights mining revenue, mortgage GMAT to become a miner. Use the universal map service to sustainably enjoy the high-quality map service brought by the prosperity of ecological data. Such as sharing car drivers, couriers, etc., the super spatial oracle verifies their service performance, the smart contract directly distributes income, without third parties, mortgage GMAT as a credit contract. That is, the creators and operators of smart contracts, based on operation demands, mortgage GMAT to obtain "visual location-based smart contract templates" or self-programming development, thus creating a decentralized executed business application, for example, the store can use the location smart contract to achieve advertising drainage, and the restaurant can use the location smart contract to mobilize the delivery service, etc. That is to say, GoZone virtual land rights "landlord", has the commercial income right of a certain range of spatial digital assets, is the backbone of ecological promotion and maintenance. "Our goal is to enable application such as taxi, express delivery, food delivery, room reservation, social networking, and gaming to call by GoWithMi decentralized location-based service, leading the mass deployment of blockchain in the business of clothing, food, housing, and transportation," said Oliver Li, founder of GoWithMi. In particular, he pointed out that relying on blockchain technology such as decentralized maps; emerging countries can bypass the centralized Internet model and directly move toward to the token economy and distributed business civilization, allowing the 4 billion dividend population directly leap into a new era of commercial evolution, which is also an opportunity for the blockchain to achieve edge breakthrough. Not afraid of the cold, like splitting bamboo. GoWithMi is based on decentralized location-based service, leads the blockchain into the necessities of life. Google & Temasek predicts that the scale of the Internet economy in Southeast Asia will increase sevenfold in the next seven years, surpassing $240 billion, and the map service here is weak, which is difficult to meet the upcoming Internet development needs. GoWithMi is using this region as an entry point to seize the opportunity. In April 2018, the first map app was launched in Indonesia. At present, the natural download has reached 1.1 million+, and the daily active users have reached 20,000+. The consensus production data quality has passed the world's most rigorous automotive pre-installation standard test, entering the global car dealer procurement catalog. GoWithMi will achieve full coverage of 650 million people in Southeast Asia in 2019, gradually cover Africa and South America in 2020, and achieve global coverage in 2022. The founding team members of GoWithMi are top experts in the field of global geospatial information industry. Founder Oliver Li was the head of Navteq (Here) Asia Pacific, the world's largest infrastructure map service provider before founding GoWithMi. With over 20 years of global operating experiences and continuous successful entrepreneurship ranging from big data, mobile, and the mapping sectors，He is the only continuous entrepreneur in China's spatial information industry that was acquired by two A-share listed companies(NavInfo 002405.SZ & Blue Focus 300058.SZ), was praised as the "most reliable and successful entrepreneur" by Manzi Xue, the father of Chinese angel investment. Global map service imbalance: global map service coverage, real-time, and update presents regional imbalances. Emerging countries with a population of 4 billion cover 60% of the world, or small and medium-sized cities in developed regions, they all lack high-quality maps. GoWithMi's consensus collaborative production and consensus incentive mechanism can just mobilize users in these regions to jointly build a high-quality map and form a new map economic ecology of "everyone for me, I am for everyone". Privacy and business lifeline are controlled: Google Maps and other centralized platforms force collection and occupation of user geographic data and customer business information, GoWithMi uses "storing full data on the chain, storing full services on the chain, user private key to control the data" to return data rights and value income to users and businesses. Smart contracts lack spatial oracles: blockchain networks like Ethereum and EOS have no direct way to obtain trusted location-based information outside the chain. This requires a "spatial oracle". The GoWithMi super spatial oracle can be invoked by various blockchain platforms and smart contracts to help it be mass deployed in businesses such as clothing, food, housing, and transportation.